Investigators process the scene of the fatal officer-involved shooting this afternoon of a homicide suspect who emerged from the blue truck holding what appeared to be a gun. Spokane Police officers shot and killed the primary suspect in a newly initiated homicide investigation this afternoon when the suspect allegedly drove through police barricades at the homicide scene and emerged from a blue pickup with what officers believed to be a handgun. Investigators had shut down several blocks surrounding the corner of Jackson and Standard in North Spokane when the blue truck sped up to the scene at about 1:45 pm, police officials say. A photo from a KXLY crew at the scene shows a man with a gray object in his hand. "Officers engaged the individual believing that there was a threat to the officers and the community," an SPD news release states. The man died at the scene. Investigators reported recovering "what appears to be a firearm" from next to the suspect's body. Detectives with the Spokane Investigative Regional Response team soon arrived to take over the shooting case. The Spokane County Sheriff's Office will lead the investigation. Police say a woman's body had been discovered at a home on the 2500 block of North Standard this morning. Investigators had identified the man in the blue truck as a person of interest in the homicide. Approximately an hour after the shooting, detectives continued to process the scene and interview witnesses. A yellow sheet covered the suspect's body just outside the door of the blue truck as reporters huddled down the block. 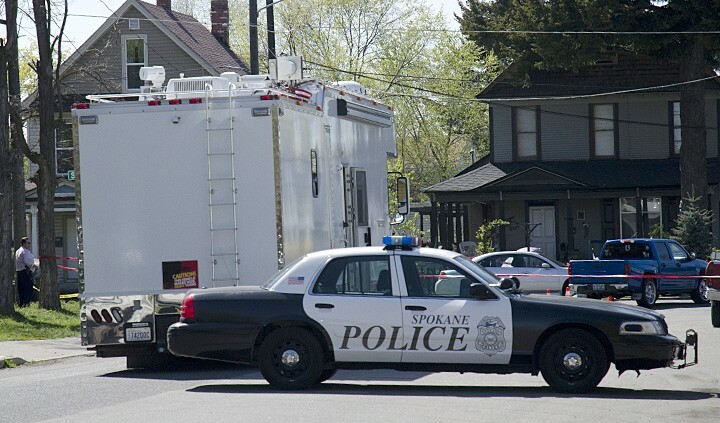 This incident marks the fifth Spokane-area officer-involved shooting of the year. Authorities say the Spokane County Medical Examiner will release the identities of the female homicide victim and the suspect who was killed. The investigation remains ongoing.